Many aspects of publishing—including arrangements with authors, agents, illustrators, freelancers, employees, printers, binders, and distributors—involve contracts. The terms of a contract vary depending on the situation, but in every case, the nature of legally binding agreements is the same. Here are three common forms of contract. An oral contract is one in which the parties have verbally agreed to something but have not recorded the agreement in writing. Most oral contracts are valid and enforceable, although some kinds of agreements are legally required to be in writing to be enforceable. As a practical matter, oral contracts are often difficult to prove in court, since the main evidence is usually the conflicting testimony of the parties. It has been said that oral contracts are not worth the paper they are written on. While not technically correct, this adage does reflect the harsh reality that many worthy claims cannot successfully be enforced because oral agreements lack the strength of written ones. Written agreements should adequately describe the obligations of the parties and the consideration involved. Custom dictates that written contracts be signed and dated by the parties. Under the Electronic Signatures in Global and National Commerce Act (ESIGN) and various state laws, transactions executed electronically, such as by email, cannot be invalidated solely because an electronic signature or electronic record was used in their formation. An electronic signature is any identifying mark, such as the sender’s name at the end of an email or email address in the header. Some kinds of documents, such as wills, are typically covered by these laws, as are most publishing agreements. Some types of agreements are legally required to be in written form. The Statute of Frauds, a law adopted to inhibit fraud and perjury, provides that any contract that cannot be fully performed within one year must be in writing in order to be legally binding. This rule has been narrowly construed to mean that if a contract can conceivably be performed within one year of its making, it need not be in writing. Assume that a writer has agreed to submit two manuscripts to a publisher—one within eighteen months after the contract is signed and the second within eighteen to twenty-four months thereafter and no earlier. In this situation, the terms of the agreement make it impossible for the writer to complete performance within one year. If, however, the writer agrees to submit both manuscripts within twenty-four months, it is possible that the writer could submit both manuscripts in the first year and the requirements of the Statute of Frauds would be satisfied. The fact that the writer might not actually complete performance within one year is immaterial. So long as complete performance within one year is possible, the agreement need not be made in writing. The Statute of Frauds applies to other kinds of contracts as well, but these rarely involve writing activities. For a contract to be enforceable, the parties must be capable of understanding their contractual obligations. Minors are deemed by law to have diminished capacity to contract. A person is legally a minor until the age of majority. This age varies from state to state but is either eighteen or twenty-one years of age in most states. Persons who have the capacity to enter into contracts and who sign written agreements are generally bound to the terms of those agreements, irrespective of whether they read or understood the agreement before signing. The law imposes the burden on the parties to read proposed agreements and understand the terms prior to signing them. The fact that an agreement was lengthy, obtusely drafted, or complicated will seldom justify rescission, except when the terms are unconscionable or against public policy. 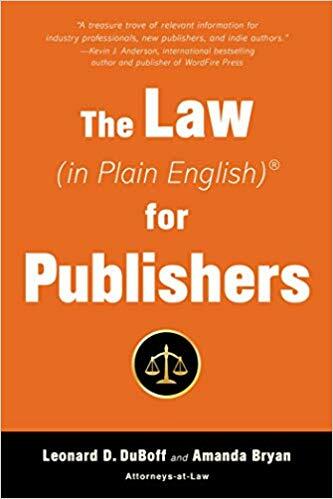 For an in-depth guide to legal issues from a publisher’s perspective (especially helpful for prolific indie authors and small presses), check out The Law (in Plain English) for Publishers by Leonard D. DuBoff and Amanda Bryan.